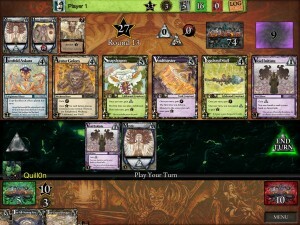 My favorite iOS game – for several years now – is Ascension: Chronicle of the Godslayer. 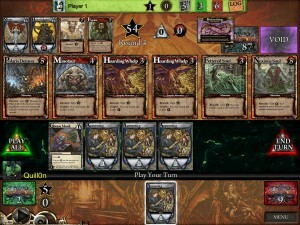 It’s a card game by Stone Blade, but it has an excellent iOS implementation by Playdek. Unfortunately, it seems that the lifespan of Playdek’s version is coming to an end (more on that below), so I wanted to write a post about it before the end arrives. Ascension is a “deck-building game”, which shares some things in common with “trading card games” (such as Magic), but has the key difference that it’s not “collectible”, which means that you can’t build better decks by spending more money on cards, and you don’t need to sink money into it to stay competitive. Rather, each game starts with each player having a pre-determined deck of cards, and there’s another set of cards which the players can acquire in the course of the game. “Acquiring” a card usually means spending some resources and putting the acquired card in their discard pile. Then when they finish going through their deck, they shuffle their discard pile into a new deck and draw from it, so they can use the cards they acquired on their last time through the deck. But the key is that players are on equal footing – everyone’s playing the game with the same pool of cards. In Ascension, each player starts with 8 Apprentice cards, which provide points (“Runes”) to acquire cards, and 2 Militia cards, which provide points (“Power”) to defeat Monsters. The rest of the cards in the set are shuffled into a draw pile, and six of them are laid out in the center row. These are the cards which can be acquired (if they’re Heroes or Constructs) or defeated (if they’re Monsters). Defeating Monsters gains the player Honor. The game starts with a pool of 60 Honor to be gained, and once the two players have gained at least 60 Honor between them, the game ends. Heroes and Constructs acquired also provide Honor (but Honor which is not counted against the pool of 60), and the winner is the player with the most Honor from defeating Monsters plus Honor from acquired cards. Each turn a player draws 5 cards. Heroes are cards (including the Apprentice and Militia cards) which are played once that turn to provide an effect. The effect can be to provide Runes or Power, or to do things like draw more cards. 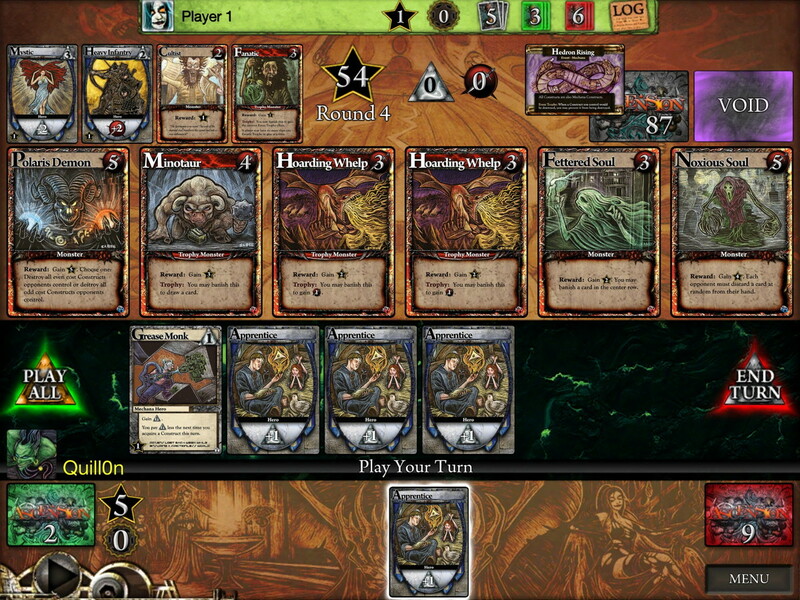 Constructs are played and remain on the board, and have a continuous effect, for example to provide 1 Power each turn. Defeating Monsters can have effects besides producing Honor, they can also produce Runes, or they can have effects like making the opponent discard a card, letting you draw a card, or making them discard some of their played Constructs. 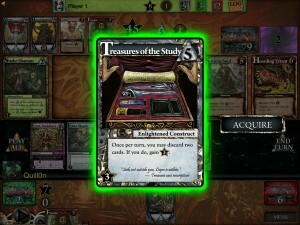 When you acquire a card from the center row, or defeat a Monster in it, it gets replaced by a card from the draw pile. There are also four factions, which the Heroes and Constructs in the center row belong to, and some cards’ effects have an additional impact based on their faction. A mid-game turn, with some of the more interesting cards from the original set in the center row. When I started playing the game I thought it was going to be a pretty simple game and I’d give up on it before long, but I soon found that it had surprising depth. It took me a little while to realize that acquired cards provide Honor – this is key because Constructs from the Mechana faction in particular provide much more Honor than other cards. But I quickly learned that the principle of acquiring better cards (basically, investing in future turns) tends to trump defeating Monsters early on, while when the pool of Honor is nearly gone you want to make a mad grab for the most valuable cards. Sometimes I’d take a balanced approach, other times I’d focus single-mindedly on building up my deck. Some cards allow you to get rid of the less-powerful cards in your deck permanently, which I tend to prioritize, even above (most) card-drawing cards. Another turn from the same game, with the cards currently in my deck exposed. On our trip to Hawaii in 2011 I spent a bunch of our free time playing Ascension, and got quite good at it. Then they started releasing expansions to it, available as in-app purchases. I was skeptical that there would be a lot they could do to make it more interesting, but they’ve actually come up with a lot: New effects you can trigger, new Monsters, and even just new permutations of earlier cards. Even when I felt I had gotten as much as I could out of an expansion, I would sometimes notice a card or two which I’d rarely played with because it didn’t feel very useful, and I’d wonder whether I could craft a winning strategy around it. And usually I could – the card was there for a reason, but you had to figure out how best to use it. 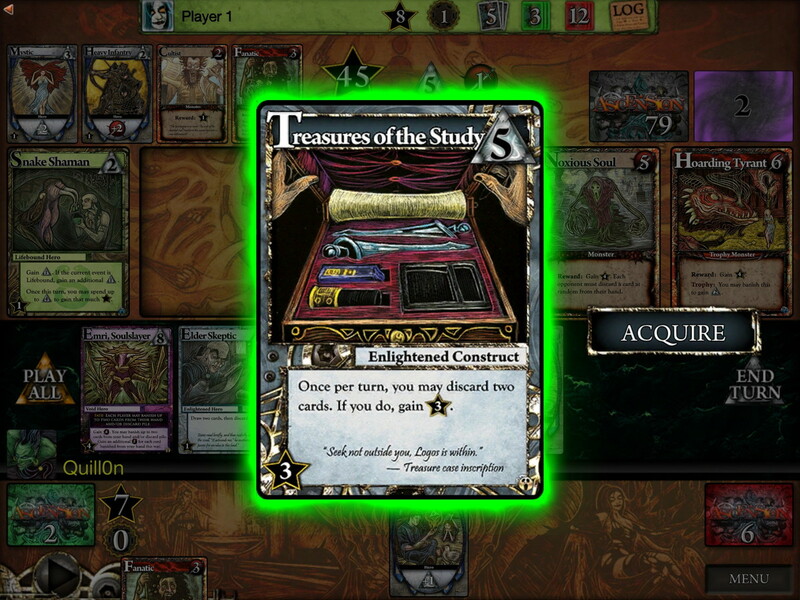 Treasures of the Study is a neat card to build around if you can acquire it early. It’s hard to imagine playing the physical card game – the app does so much bookkeeping for you, from tallying players’ Honor, to shuffling their decks, to making random selections where appropriate. Despite being a “card” game, it feels designed for computerized play. 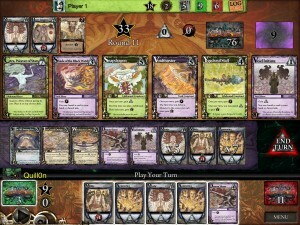 Sometimes the board gets degenerate: Here the center row is all Monsters, but as usual I have no cards providing Power. Sadly, the number of people playing the iOS game seems to be dwindling – I often check new games and see very few or even none available to join, when a year or two ago there would have been dozens. I believe the reason is newer expansions of the print game have not been coming to iOS, probably because Stone Blade is pulling back the rights to the game from Playdek. Early last year Stone Blade ran a Kickstarter campaign to bring Ascension to Android and PC, and I bet they plan to eventually do an iOS client of their own, playable with the Android and PC versions. If that’s the case, then the real question is whether their implementation can be as smooth, easy to use, and bug-free as Playdek’s. It’s one of the best implementations of any game I’ve seen on iOS, and I am unsure whether iOS users would accept anything less. 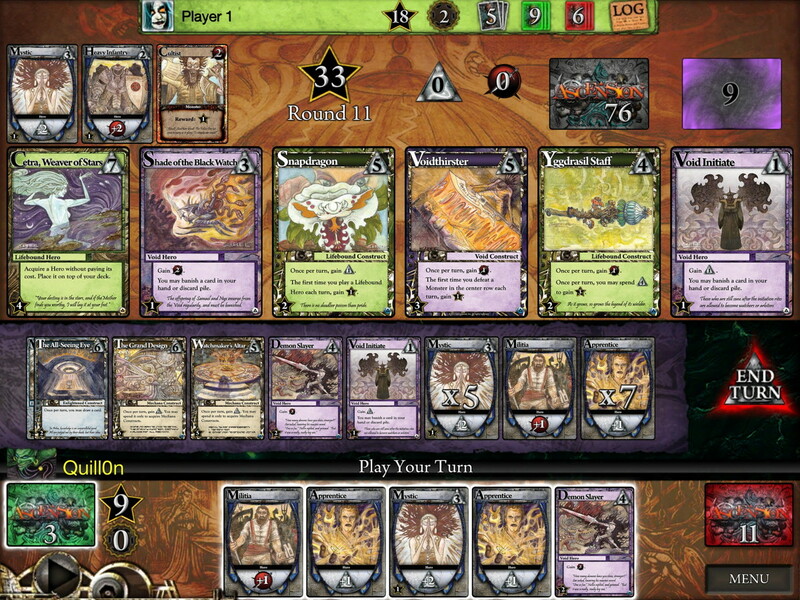 In any event, the iOS version of Ascension seems to be dying, and I think Stone Blade is missing out on the chance to keep people excited about the game by not letting Playdek bringing the newer expansions to it as they come out. If the environment dies out entirely, then by the time they bring out a new client for “Ascension Online“, players like me might look at it and think, “Yeah, that was fun to play, but I’ve moved on to other things.” It seems very shortsighted. Anyway, I’ve been enjoying the game for about three years now, and it’s sad to see it dwindling like this. On the other hand, playing it less means more time for other things. Probably not what Stone Blade has in mind, but that’s the way it’s working out. If the end is nigh, well, it’s been a good run.